The Duke and Duchess of Windsor had one of the most melodramatic love stories of the 20th century, right up there with John Lennon and Yoko Ono. In the early 1930s, the Prince of Wales became smitten with international socialite Wallis Warfield Simpson—drawn by her sharp wit, imagination, and generosity, even though she was still married to her second husband. Less than a year after he became King Edward, in 1936, he shocked all of England by abdicating his throne, throwing away his reign as King of Britain and Head of the Commonwealth, just so he could marry “the love of his life,” an American woman who’d been divorced twice. His brother, George VI, who became king, created the Duke of Windsor title for him. The Windsors documented their passionate love affair throughout the rest of their lives by trading extravagant and deeply personal jewelry—many of these tokens of affection will be auctioned off on November 30, 2010, at Sotheby’s in London. Of course, with all the gold, diamonds, emeralds, and rubies involved, the auction prices are bound to reach the stratosphere—some are expected to sell in the millions. Nonetheless, it’s a stunning collection to gawk at, and it’s hard not to get swept up in the overt sentimentality of it all. The romance is spelled out in a chapter of the recent book, “Famous Jewelry Collectors,” by Rhodes and her former colleague Stefano Papi. Years before they were married, the Prince fawned over Wallis, lavishing her with ornate jewelry, many pieces of which he had specially commissioned for her. She responded in kind. These gifts of platonic friendship are thought to have been coded with secret meaning. In 1957, Cartier created this ruby-crowned 20th-anniversary brooch for the duchess. Like many of her pieces, it was a gift from her husband, the duke. For example, a gold cross-shaped pendant Edward gifted to Wallis in 1934 was inscribed with “WE are too,” believed to mean “Wallis and Edward are also in love.” That cross was attached to a 1935 diamond Cartier bracelet, eventually adorned with eight other crosses, all of them set with jewels and engraved to commemorate life events like the couple’s wedding, her appendicitis operation, and even an assassination attempt on the king. But these romantic, indulgent gifts didn’t end after the two were married. In fact, the couple doted on each other until the duke passed away in 1972. In addition, because the Duchess of Windsor was considered a fashion trendsetter, when the duke had a piece of jewelry commissioned for her, she would then have a dress designed to match it. 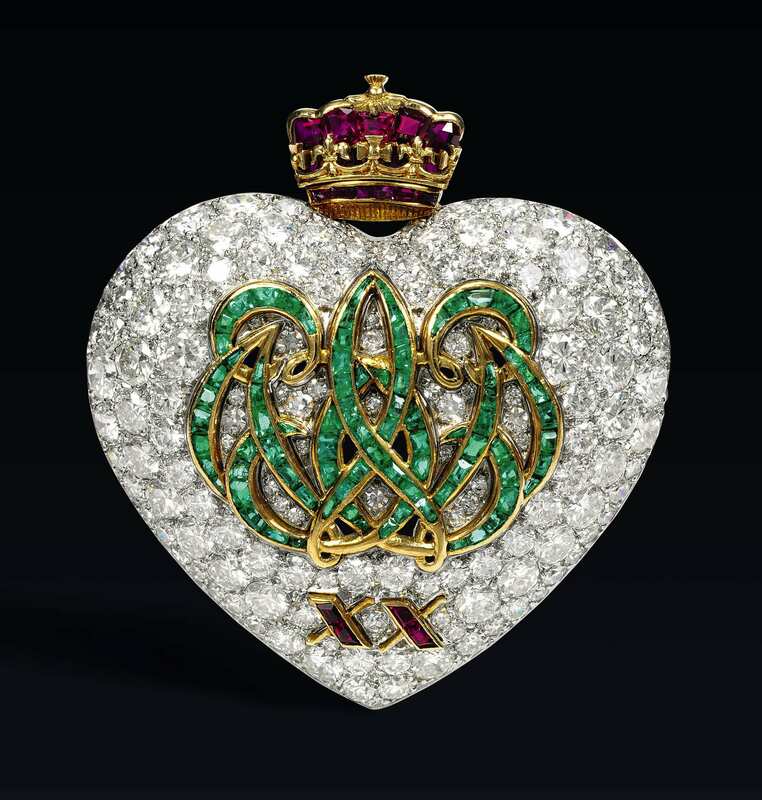 For their 20th anniversary, the duke gave the duchess a heart-shaped diamond brooch with an emerald pattern script “W” and “E” intertwined and a ruby crown on the top. Edward always regretted that Wallis was never bestowed the designation of Her Royal Highness, so the crown was a part of their lifelong love code spoken in jewelry. 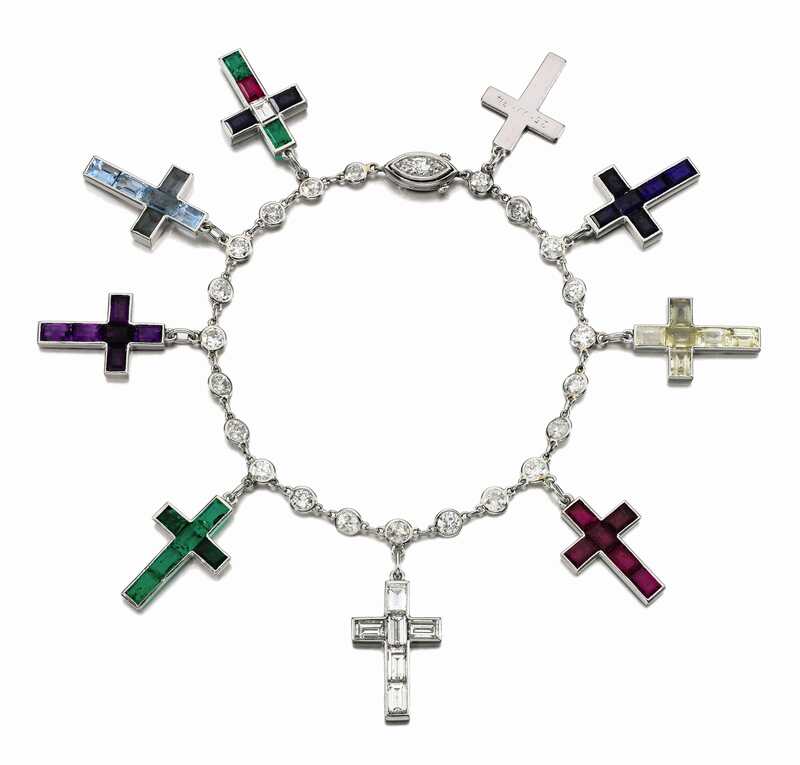 This diamond bracelet featuring numerous bejeweled crosses was made by Cartier between 1934 and ’44. 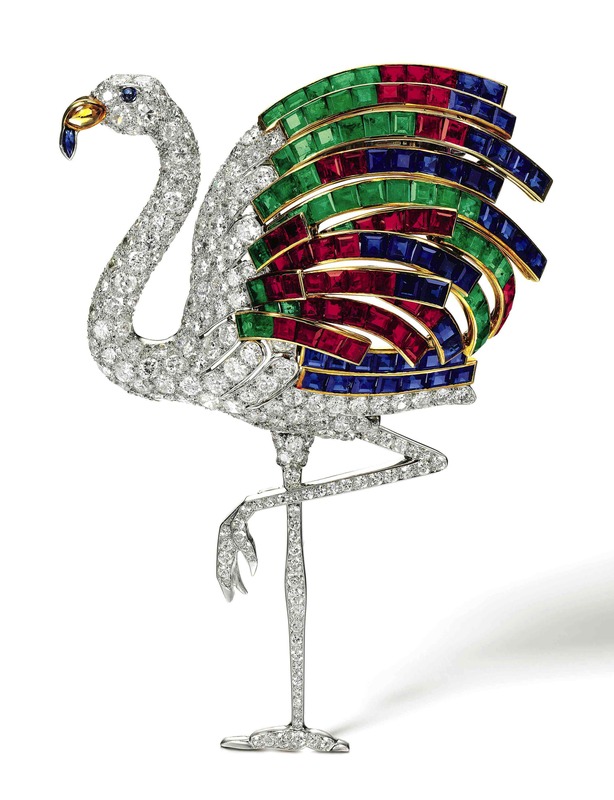 Outside of this blatant mushiness, the Duke of Windsor gave the duchess many unengraved pieces that stand out simply for their creative designs and craftsmanship, including much of Cartier’s famous “great cat” menagerie. 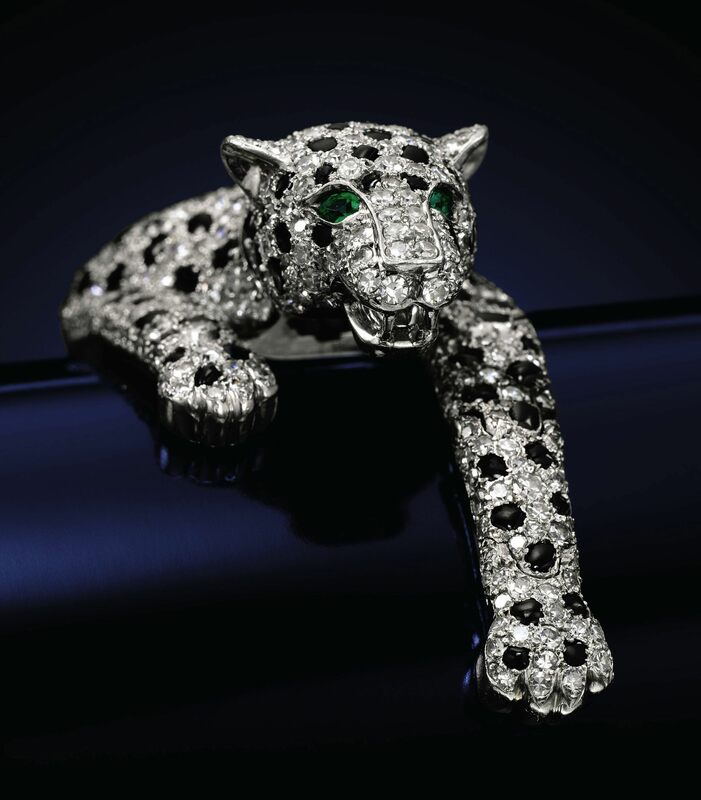 This collection was inspired by high-end jewelry director Jeanne Toussaint, who was nicknamed “The Panther” by her good friend, and employer, Louis Cartier because of her fascination with panthers, whose skins she enjoyed as rugs. Toussaint worked with Cartier’s designer Peter Lemarchand to design the jewelry line. A masterpiece of the duchess’s collection is this onyx-and-diamond panther bracelet, 1952, part of Cartier’s “great cat” menagerie. So are these two almost-royal lovers to blame for the romantic mystique surrounding diamonds and jewelry? That would be hard to prove, but the auction does offer a glimpse into the Windsors’ rarefied, glamorous world—the adoring inscriptions, the crosses, the cigarette case, the love heart, the cufflinks, the cats, and even a stunning bejeweled ’40s flamingo the ever-elegant Wallis wore to all the major balls in Paris. In November, bidders will have their chance to decide just what all that history, artistry, and romantic display of affection is worth. The Duchess of Windsor’s jewels will be on view at Sotheby’s in New York from October 29 – November 2 and in London from November 26 until the auction date of November 30, 2010. “ ” 7Up had to differentiate their product from 'The Establishment' colas they were competing with at the time, which were Coke and Pepsi.